1. Did you know that between 60% and 90% of people with SAD are women? It’s true. If you are a female between 15 and 55, you are more likely to develop SAD. Great, so not only do women have PMS, Menopause, and child labor to worry about, add SAD to the list, too. 2. Even though the harsh chill in the air might bring you down, SAD is believed to relate more to daylight, not the temperature. Some experts believe that a lack of sunlight increases the body’s production of a body chemical called melatonin. Melatonin levels are what helps regulate sleep and can cause symptoms of depression. 3. SAD can be treated. If your symptoms are mild, meaning, if they do not interfere in and completely ruin your daily life, light therapy may help you beat SAD. Using light therapy has shown highly effective. Studies prove that between 50% and 80% of light therapy users have complete remissions of symptoms. However, light therapy must be used for a certain amount of time daily and continue throughout the dark, winter months. 4. Some say that light therapy has no side effects, but others disagree. We think it simply depends on the person. Some people experience mild side effects, such as headaches, eyestrain, or nausea. However, these light therapy users say that the side effects are temporary and subside with time or reduced light exposure. Most scientists agree that there are no long-term side effects, but remember to consult your physician before any treatment decisions are made. 5. 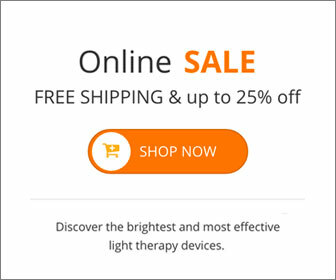 There are some things to consider if you want to try light therapy in your home, otherwise you will not receive all the benefits that this type of therapy offers. Many people are not aware of this, but you must have your eyes open and face the light during therapy. Do not stare at the light. That would be silly. Simply face the light therapy box, eyes open. This entry was posted on Tuesday, February 14th, 2017 at 9:20 am	and is filed under Depression, Light Therapy, SAD. You can follow any responses to this entry through the RSS 2.0 feed.